Please let us know mínimum 72 hours in advance of any changes. Otherwise first night will be charged. *BEST FOR 2PAX IN OUR QUEEN PODS!! *OUR HOMEY LA FLORESTA/GUAPULO LOCATION- Mi Casa Es Tu Casa Neighborhood where one grows up safe and where you can live like a local whilst being close to all tourist sites. Where families grow up, go to parks nearby, go to bakeries and where adults go for some great craft beers after work. All of this is less than 5 minutes walk from El Hostelito and you are less than 15min away from all touristic areas (walking or bus). We chose this location to make you as a guest feel what the real Quito is about, with La Carolina park right around the corner and Hay Pan french bakery at our doorstep, you will get a sense of a safe side of Quito not a lot of tourists get to see whilst all the tourist attractions are less than 15 min away walking (Foch Square) or by bus (Historic Center), we also have Free Food Walking tours around our La Floresta Neighborhood. We chose this location so that you can go out at night and feel safe and can have a feel of how I grew up here in Quito. We have the best beers and bakeries as our neighbors and parks to run around in. Do you feel like you need a good rest after long time of traveling? Or do you need a nice place to stay after nights of bad sleep in not-so-great hostels? Look no further you have arrived home. -Mini market underneath us so that you can buy last minute food and amenities. -HAY PAN french bakery less than 200 meters away. -UMAMI CAFE next door to us where you can have great coffee, sandwiches, salads, brunch, etc. -BANDIDOS DEL PARAMO BREWERY is 250 meters away and offers great beer and food options until late night. -Supermaxi grocery store less than 300 meter away. We are here to provide you with everything you need, we want you to have a Pod Experience. *Breakfast included except for non-refundable rate. El Hostelito checks all the boxes for a perfect hostel experience. Their pod beds offer excellent privacy in the rooms and each pod even has its own light and power outlet. The Hostel has also achieved a perfect balance of Social but not full on party. It's almost as if everyone had the same mutual friend who invited them to hang out at his chill apartment in Quito. Just like everyone passing through El Hostelito, I'll be back one day. El Hostelito had by far the comfiest beds I've slept in, in South America so far. The staff was also so friendly and helpful. Would highly recommend! the LOVELIEST hostel - queen sized beds the comfiest we've slept in South America, the privacy curtain and the "pod experience" makes it all the more luxurious, staff are the friendliest people and will go out their way to help you. There's a giant map on the wall so you can easily plan where to go and what's within walking distance. Only 3 nights in Quito but would've stayed here longer. Not in the centre but easy to get there, MUST go to bar behind hostel: cheap, big portions, great beer. El Hostelito was simply incredible. We had no idea what to do in Quito and they hooked us up with the perfect paid and free tours. Any questions we had, they had the answers. Breakfast was amazing, and the whole place was SO CLEAN. 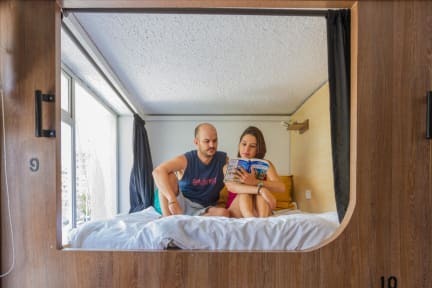 The pods are awesome and we’ve never come across ones with QUEEN sized beds. It was so perfect. Couldn’t recommend enough!!! This place was awesome!! The beds are cozy and private it’s like being in a hotel. Ben was amazing, he was so helpful. He told us where to go, what to see, and where to eat. He clearly drew out a map and made great suggestions for our quick visit in Quito. Would stay here again! Signs should be put up asking people (specially girls) to have their conversations outside of the dorm areas. Other than that, everything was great!! Very helpful staff. Great location. There is a very small supermarket right next to the hostel entrance that is very helpful. Enjoy Quito!! Comfortable beds with privacy curtains! Great atmosphere and an amazing crew! Ben, Claire and everyone else were super helpful. We had a ton of fun in the hostel when it was raining outside. Pool, ping ping, beer pong, poker, movie nights, staff dinner nights and so much more. I loved my stay here. Would definitely recommend! Stayed at El Hostelito several times during my time in Quito and it became a cozy and familiar home base by my third stint. the hostel is not exactly on a quiet street but without the crowds, bars and vendors it is very peaceful in comparison to the city center. The bathrooms are clean and plentiful, there are three different outdoor areas including a rooftop and a BBQ and the staff is very down to help you find your way around Quito. Major bonus is Hay Pan bakery one block away! This hostel has good facilities, bathrooms were clean and plentiful, good beds with reading light, shelf, charging point and curtain, great big lockers too. Good kitchen but can get a little crowded. Location is ok, a bit away from old town but taxis are so cheap it doesn’t matter, good restaurants and coffee nearby. Staff were helpful and friendly, however it did seem like most of the people staying there were volunteers, so it got a bit crowded with all of them. Would recommend. Good, safe location, but a cab ride away from the nightlife (which is not in a safe location). Staff is a bit confusing. I couldn't figure out who was an employee vs. who was a volunteer. It was kinda odd. Beds were comfortable and private. Not much social atmosphere, maybe due to the people that were staying there at the time. Biggest complaint is the bathrooms which are incredibly loud while having insanely tiny and cramped toilets and showers. Kitchen was a bit gross.